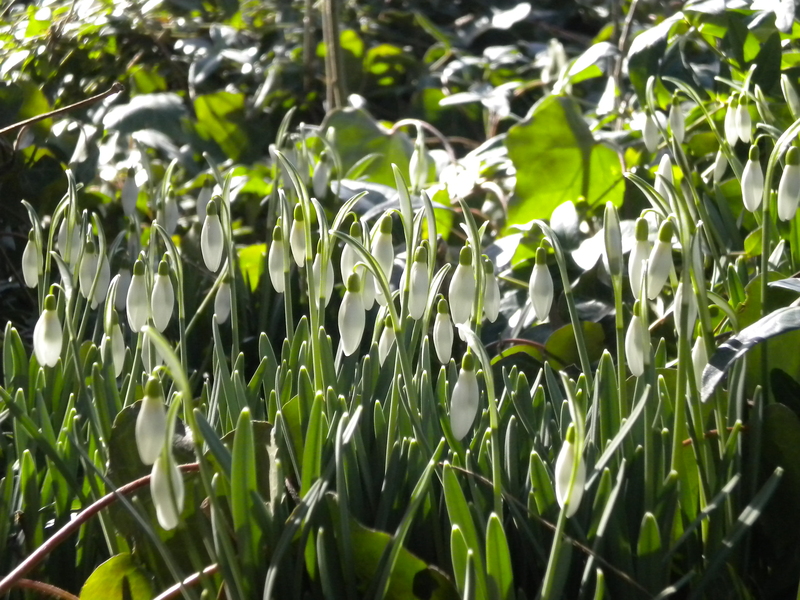 Snowbells on early. Christmas cactus bloomed late. We’re arriving at spring before we got to winter, but considering the winters we usually have in the Inland Northwest, no one here is complaining. Still. craving sun and rest, I recently took myself on a little vacation by myself—leaving Phil to gut the kitchen pantry to make way for the fridge. When you say to a friend who lives in western Nevada, “I feel like I just want to spend a week sitting in hot springs,” and she says, “Well, we have hot springs where I live,” what can you do but scrape out the penny jar and buy a plane ticket? That’s how I ended up spending the last week of February hot springs hopping along the eastern Sierra range, having a 2-hour visit with a doctor of Chinese medicine, and allowing myself to be needled from all angles. Having once gotten a treatment for a badly strained Achilles tendon, I knew acupuncture and Chinese medicine had been around for thousands of years, but I did not know that Otzi the Iceman, the 5300-year- old body found frozen and well-preserved in the Alps in 1991 had acupuncture points tattooed on his body. I’m completely impressed by this, and humbled by the fact that this means acupuncture is thousands of years older than was presumed. When wisdom 5000+ years old speaks to me, I listen. What I learned about myself was that I wasn’t doing so hot in the spleen and blood categories caused by—sigh—dietary issues. No, I don’t eat fried foods. No, I don’t eat sugar. No, I don’t eat processed foods. But, I might be guilty of excessive caffeine intake, and I might on occasion have more than one glass of wine. My diagnosis surprised me. I thought I was doing okay, troopering through my father’s passing, but the meridian that guides my heart and small intestine said something different. Of course, I was not allowing for the fact that his death signaled the end to twenty-three years of my having tried to manage his and my mother’s health needs from two thousand miles away. Anxiety, the diagnosis. “But I’m not anxious,” I said. No fooling the body, apparently, as the graph showing energy flow indicated just the opposite. Not much life force swirling around in there. In fact, my qi was only a tick, not a ticktickticktick. You could say I was a stagnant pond, in the Chinese vision of human potential. Had I adapted to the level of stress with which I live? Did I live with anxiety? I thought I might work too much, but—anxiety? Acupuncture gave me a jump start on all counts, lifted me out of the jelled state I was in. What I know now that I didn’t know nine days ago is that I needed the jump start. Come to think of it, I had gotten used to a pretty high level of coping. The prescription also included adding some wild-caught fish back into my diet, taking several times each day cups of herb-based tea prepared from the doctor’s pharmacopoeia just for my set of conditions, plus doubling my intake of water. Of issue was the fact that I was only taking in half as much as the body needs. Much like a camel, the body will store water if it’s not getting enough. Thankfully my humps were settled about my hips and not my spine. This translates to me burning extra calories this week by running to the bathroom every hour. I’m not saying how much I weigh, but at one ounce for every two pounds of weight, let’s just say I’m drinking a bucketful of water every day. Also means my body isn’t holding onto water as much. Having quickly clued into the fact that I’m going to give it a sufficient supply, it appears to be letting go of the old, moldy stuff: in one week I’ve dropped eight pounds. What can I say? I simply never was thirsty—which, of course, is a symptom of dehydration. The difference between life hydrated and life dehydrated is the difference between organic, fair-trade chocolate and the kind you pick up at a convenience store, in case anyone asks. No wonder I kept dreaming of being in a desert. Between having started yoga and meditation as a means to find peace after my father’s death, and now having found Chinese medicine—which I’m so very excited to learn more about and which is a natural extension of my earlier interests and will aid me greatly as I explore more the relationship between plants and healing for Blue Moon Medicine Woman—this year has started out as a completely new beginning. It’s the Chinese year of the Fire Monkey, the sign under which I was born, so perhaps this is poetic. From the moment of my father’s passing, I’ve been more interested in the potential for grief to transform, rather than its potential to be sad. Having the miracle that is Chinese medicine suddenly open up to me and me to it feels exactly appropriate. Evidence once again of how life is always striving to help us reach our ultimate level of function, how in its flowing it asks only that we flow with it.